Autumn leaned her head inside the cavern and glanced left and right, moving her pocket flashlight in sync. It appeared empty—at least as far as the flashlight’s beam could show. The only movement here, other than Autumn’s eyes, were the drops of water dripping without rhythm from the stalactites looming above. Montago Estación was a tall, anthropomorphic orange cat in a business suit and deep blue navy hat. She had heard about his running a sailing business for helping people get around the Verdazul archipelago and had decided that his price was as cheap as she was likely to get. “Great. So you can show me where the treasure is,” Autumn said. “That was not part of the deal, Madame,” Montago said with his arms akimbo. Edgar was standing farthest away from the cave, near a birch tree at the bottom of the hill from whence they came. Edgar wasn’t looking at them, but shyly staring down at the pebble-filled ground as usual. “I’d, uh, rather not get involved…” Edgar said. “And I suppose you’ll still want to be paid, right?” Autumn said sourly. “That was the deal, yes,” Montago said. She extracted her checkbook, filled out the first page, and handed it to Montago. Edgar gave Autumn a meaningful look, but saw that Montago was leaving nonetheless. She walked through the entrance and Edgar followed cautiously, looking up and down at anything—a boulder, a stalactite, a different-colored tile signaling a trap door—that could potentially harm them. Autumn didn’t turn back to look at him, not wanting to delay her trek any further. She simply kept forward, hands in pockets. The path went straight so far; just a narrow passage wedged between two red-gray walls of chiseled rock curving in at the top. Edgar remained on alert as before while Autumn stared down at the ground, unconsciously kicking loose pebbles as she walked. Eventually, her eyes caught something to her left: another path. She raised her head to see that she was at a fork between the path she was already on and the other path through the passage in the left wall. Her eyes shifted back and forth between them and squinted in an attempt to see what was down either path, but could see no clue. Autumn didn’t turn back to look at him; she continued looking between the two passageways. Edgar began to shiver, being blocked from the warm sun outside by this cave’s cold, crepuscular, craggy walls. He moved in closer to Autumn so that he could be closer to the small light of her flashlight and farther from the darkness surrounding them. Edgar nodded, although Autumn was turned away from him and couldn’t see him. Knowing Edgar didn’t care either way, Autumn didn’t wait for a response and walked down her chosen path; Edgar followed silently. The new path was narrower, which only made Edgar feel as if the walls were closing in on him even more. Still, he preferred seeing the walls so close—and being able to see that they were not moving—than to be able to see little, and so he kept his head up this time, making sure to keep close to Autumn’s light. Autumn swished her flashlight left and right repeatedly so that she wouldn’t miss any other pathways. Autumn was unsurprised when she saw the ground change in front of her; she raised her flashlight to see that it was, as she thought, a dead end. 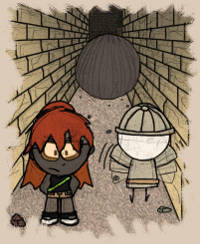 She stopped at the edge and saw that it was a hole that went from wall to wall, no way around it. Raising her flashlight again, she saw the path continue after about five meters past the hole—much too far to cross. She looked back at Edgar to make sure he didn’t keep walking and accidentally fall in the hole; to her relief, he was still standing behind her, safe. Edgar saw her look at him and shrugged. “I guess we’ll have to go back and take the other path,” he said. But Autumn turned back to the hole. She sat down on her knees and leaned her head down near the ground, eyes over the hole. She pointed her flashlight down it, moving it around to reveal splotches of the area to be put together in her mind. The hole was about ten feet deep and seemed to lead down to another part of the cave; a passage that was more than twice as wide as the one she was already on. Leaning all the way right and twisting her head a little, looking left, she could faintly see the walls of this area: Instead of rocky walls, they were golden bricks. Autumn’s heart jumped. Golden bricks means treasure! she thought. Edgar held onto Autumn’s ankles, and she leaned backward—a little too quickly, as she smacked her head hard against the wall leading down the cliff. Edgar dutifully dragged Autumn’s feet down the cliff until her entire body was about a foot below the top of the cliff, hanging upside down—causing her helmet to plummet to the ground—from Edgar’s outstretched arms while he was leaning halfway off the cliff. Autumn didn’t say anything, but only held her glasses so they wouldn’t fall and turned her head all around, looking at everything she could. It was then that it finally came to Edgar’s mind that perhaps Autumn might be a little heavy for his weak arms to hold up, which made him worry about how long he’d be able to keep her from falling, much less how he was going to get her back up. Autumn was positioned low enough that she could see the golden brick walls better, but not much more important. For all she could see, the long passage was empty, and seemed to end in a perpendicular fork going left and right. But her thoughts of how she was going to get down there safely were interrupted when she felt herself shift downward a little. She looked up and saw Edgar’s upturned head closer than it was before, cringing from Autumn’s weight twisting his body against the edge of the cliff. “I’m sorry, Autumn, but I can’t hold on much longer—” Edgar struggled to say. Just then, Autumn fell straight down, pulling Edgar with her by his arms, until she finally landed at the bottom, crashing her head directly against the helmet still lying on the ground. After a minute or two of dizziness Autumn sat back up, rubbing her injured head, readjusting her glasses, and looking around her, when she stopped, staring wide-eyed behind her. By this time Edgar had mended his shattered bones and gotten up, he noticed Autumn seemed to be in a trance, until he followed her eyes to a large gray treasure chest sitting against the back wall comprised of pink bricks. Before Edgar could say anything, Autumn jumped up to her feet and ran for the chest. After bonking into it, falling over, and then sitting back up and regaining her composure, Autumn stared at the chest and her eyes caught the giant black bumpy hole at the front of the chest’s rim in the middle: a keyhole. She got up and tried pulling and pushing the chest open to no avail. “That is excellent deductive work, Mr. Winters. Please, keep up the good work,” she said with a scuzzy stare. “But where do you think it might be?” Edgar asked. “Well, there’s only one direction we can go now,” Autumn said. She was gazing down the hallway before her, bordered on both sides by walls of gilded bricks. But rather than the golden walls she’d already seen before, her eyes caught the tiny sparkling objects forming a line down the hallway. She stepped forward, scooped the first one up, and saw that it was a little red gem with a pointed, diamond-shaped bottom and a flattened top. All of the sparkling objects were small gems; most red, although there were a few green and one blue rectangular gem at the end. Autumn continued down the hall, making sure to pocket all of the gems littering her path, while darting her flashlight left and right repeatedly to make sure she didn’t miss any. Meanwhile, Edgar slinked behind her, his eyes scanning around the area as well, though less in search of gems and more from the fear that something might jump out any minute and assault them, devour them, or force them to look at pictures of its family. At the end of the long hall was a ninety-degree fork going left and right, between which was a large stone door with four congruent shapes embedded. No matter how hard she tried, Autumn couldn’t budge it open. She soon gave up and instead elected to focus on the other two paths. She shined her flashlight around on each of them, but could not see far down either way; all she could see down either path was just empty dirt and the same golden brick walls. Edgar nodded, not seeing any reason to argue with Autumn’s scientific reasoning. The most notable difference between this new path and the previous was that there were little Persian-style pots leaning against the walls. Autumn picked one up, wondering if a few of them would be worth the extra weight. However, as she lifted the pot, she heard a rattling sound inside. So she did the rational thing to find out what was inside: She threw it against one of the walls, smashing it into a pile of shards. Scattered among these shards, she found three green gems. As they walked down the pathway she proceeded to shatter every pot with a kick and scoop up all of the delicious gems released. While the route looked pretty much the same to them as the last one—save the pots full of gems—it eventually ended in a manner that was much more original: an opening on a small cliff that lead down to an enormous room carpeted by a dark green pool of slimy water. In the large lake Autumn could see a couple graying skeletal hands grasping the air right above the surface and ravenous fish hopping up and down out of the water at crack-addict speed, comprising nothing but bones and teeth. The reek of wasted bodies and bodily waste wafted up to Autumn and Edgar’s nostrils. While Autumn could see the other side of the path from her spot, she could also see that it was much too far to jump to. She watched the many jumping fish skeletons—especially their rapidly chomping sharp teeth—and thought that those choppers would probably shred them to pieces if they tried wading all the way to the other side. Edgar’s shivering, which was passing on to her through Edgar’s arm tightly clutching hers, told her that Edgar had the same idea. “I think maybe we should try the other path,” Autumn said. Edgar nodded almost as fast as the fish skeletons were leaping. Much like the path above, the left path had an abrupt end, this time breaking off to a large pit. Autumn bent down and tried to see where it led, but all she could see was pure darkness below; she figured it would likely be unsafe to casually fall in. But as Autumn examined the pit more closely, her eyes caught the row of ropes hanging down from the ceiling, tied around metal hooks embedded in the ceiling stones. She followed them forward and saw that they ended near a short cliff—about a yard of land between the pit and rocky walls surrounding the other three sides. Autumn could see something sparkle from the other side. Probably some gems, she guessed. “I think there’s some treasure over there,” Autumn said. But Autumn had already grabbed the closest rope and kicked off the ground, causing her to swing back and forth. When she swung as far forward as she could go she jumped to the next rope, and the force caused her to swing forward and back on that rope. Edgar watched this diligently while he squished his hands together, waiting for the moment when she would slip off into the abyss and disappear forever. However, she progressed from rope to rope just fine, and was soon jumping off the last rope, her feet hitting steady land once more. It was then that she realized what the sparkling object was: a gray key hanging off a hook fixed in the back wall. So Autumn dashed back into the hallway with the grey chest, smacking her face against the front of it again, and fiddled the key in the hole until she heard a loud click. She pulled up the chest lid and pulled out two items: a yellow inflatable raft and a yellow topaz tablet. She set the raft and tablet on the ground in front of her and bent down to get a closer look at them. Edgar froze in place as if he were shocked and then ran over to Autumn and grabbed her arm to get her attention. Autumn tilted her head in thought. She stowed the topaz tablet and raft in her pack and they went along toward the right path again when the stone door between the two paths caught Autumn’s eyes again. She looked at the entrenched shapes and pulled out the topaz tablet to examine it: They appeared congruent. She tried sticking it into the left slot and was surprised to find it fit exactly, glowing bright yellow light from the cracks between the tablet and the slot. However, when Autumn tried to force the door open, she found that it still wouldn’t budge. She figured the other three slots still needed to be filled and ignored it once more, continuing on her way back to the lagoon. When she reached the edge of the cliff, she dropped the raft into the green lake and watched it as if a crocodile might devour it or it might instantaneously combust. It sat stationary on the surface of the water, instead. Seeing it safe, Autumn crawled down in and helped Edgar—who was too busy hugging himself with shivering hands to do so by himself—down after. Since the raft was rather small, they both had to squeeze together with their knees drawn all the way up. As for movement, the lake was as still as a skeleton—well, except Edgar, who was still shivering—so the only way Autumn could make them move was to pull the map from her pack, roll it up into a cylinder, and use it as an oar, not wanting to make contact between her hand and the water for fear of a skeleton pulling her down or one of those bone piranhas biting any of her fingers off. “You… you don’t think any of those jumping fishies will be able to jump at us, do you?” Edgar asked as he stared down at the water. “I wouldn’t worry about it too much,” Autumn said without turning back to him, focusing her attention on rowing the raft instead. As the raft floated farther into the lagoon, Autumn noticed that there was not only one passage straight in front of her, but two more on either side. However, she noticed that the passage on the right was blocked off by a pile of boulders. The wall beside the clogged route held a red-orange plastic sign with the black silhouette image of a pile of lit TNT. Since the left route was the closest, Autumn chose to paddle in that direction, after making a quick stop at a small clump of land poking up in the middle of the lagoon and smashing all of the pots for gems. On the left path was a skinny strip of land growing up from under the water and curving upward, the rest of the path shrouded by stone walling. Directly right of this strip of land the water continued until fading out into the black horizon; except the water seemed to be moving against them in a mild current, unlike the water Autumn had encountered so far. Not thrilled to struggle through any more water—certainly not any that was in a current—Autumn parked the raft near the strip of land and she and Edgar ventured up along the path. Although the path began rather steep, after a few yards of climbing, the path flattened. The land still rose and dipped enough for someone to stumble if she had unsteady feet; but Autumn and Edgar, who were balanced and careful enough, didn’t notice these subtle level variations. What they did notice, however, were the pits littered along the path, spread over the entire width of the skinny path between the walls on the sides, and the metal boxes rooted in parts of the wall spraying fire at patterned intervals. They stood frozen with their arms hanging down their sides as they gazed at it all. “What are we gonna do, now?” Edgar asked. Autumn looked at Edgar, looked at the obstacle course in front of them, and looked back at Edgar again. “I guess we’re just gonna have to go through all of this,” Autumn said. “What? But—but how?” Edgar asked. But next thing he knew Autumn wrapped her arm around Edgar’s waist and hoisted him in front of her. “Ready for what?” Edgar asked. Autumn bolted forward, jumping over gaps and ducking under flames, all the while carrying Edgar along with her. Edgar, for his part, could only cover his eyes and try not to shiver as much as possible. “Are you all right?” Autumn asked, turning to look at Edgar still in her arm. Unfortunately, this distracted Autumn, leaving her with only a second to see a flame spurting right in front of her face. The shock caused her to jump back, only to find that there was no ground there. She and Edgar fell backward, Autumn knocking the back of her head on the cliff behind her, and they both plummeted down the pit until landing in a river of green water. They struggled to the surface, which was difficult with the current pushing them backward; but when they turned around and swam with the current, they found staying above surface easier. Autumn spat with disgust as she thought about all of the diseases that might have seeped into her mouth while Edgar hugged her tightly, shaking as he watched the water in fear of what might be waiting underneath for them. But no harm came to them—Probably because none of the skeletal fish or hands could fight the current and keep enough attention to attack them, too, Autumn thought. After a short trip, they found that the river dropped them off at the water next to the skinny, upraised path they’d just climbed. They could even see their yellow inflatable raft still floating by the coast. They climbed up to land and sat down to catch their breath. Edgar stared down at the ground in front of his feet and thought. “No, I’ll be fine going through it again,” Edgar said as he stood up. Autumn bent down so Edgar could climb onto her back, and then she rushed through the fire-and-pit hall once more. Luckily for them, this time they reached the end unscratched; unluckily for Edgar, he did get a few eight-degree burns from getting too close to some flames. Luckily for him, these burns had little effect on him other than inflicting pain, and they would never be an issue again. When they stopped at the end of the corridor, and Autumn had dropped Edgar back onto his feet, something other than the opening to the next area caught her attention: a large red metal door with the silhouette of a flame on it. Autumn tried knocking on it and kicking it, and was shocked to find that it remained closed. “I don’t think we’ll be able to open it,” Edgar said. But before Edgar could finish, he threw his arms out and yelled, “Autumn, what are you doing?” He’d just noticed that Autumn was now standing in front of one of the fire-spewing machines. “You’re latter idea was close, Edgar,” Autumn said. “Autumn, are you crazy?” Edgar shouted. The fire burst out of the machine and engulfed Autumn in flames. She was rather surprised to find that it was extremely painful—so painful, in fact, that she couldn’t stop herself from running around the area with her arms waving out in the air. It took her a while to regain self-control, during which she charged at the big metal door. As she’d guessed, it caught on fire and melted away. With both Autumn and the large door creating large flames—in addition to the machine flames—the area filled with so much smoke that Edgar couldn’t see. But after the fire died away, the smoke gradually faded, too. Edgar climbed over the soldered metal scraps at the bottom of where the door used to be to find Autumn sitting in a round pool of water with a look of relief on her face. When she saw Edgar, she smiled and held up a red key. “I’ll wager a guess there will likely be a red chest somewhere in this cave,” she said. The passage Autumn had ignored until now led into a small room with a floor made of wooden planks. There seemed to be nothing in this room except a big metal box suspended in the wall above them with the letters “C. C.” scribbled on it in black marker, just below a crude picture of a bandana-helmed skull and above the words “Ol’ Factory” in the same marker. On closer inspection of the room, however, Autumn could see through the slits between the floor planks a room below them, which held the red chest. She tried pulling the planks up, but nothing would budge except her blistered, slivered fingers; and when that didn’t work she tried stomping down on the floor as hard as she could in sync with Edgar, only to find that the wimpy-looking floor boards were stronger than they seemed. When Autumn had finally paused to look around the ground for possible weak points, she noticed a little pile of donuts lying on the ground that weren’t there earlier. She puzzled over it until she heard scraping mechanical sounds above her and looked up to see the metal box spit out another donut. “Why would someone put a machine that makes donuts in the middle of a cave?” Autumn asked as she stared up at it and scratched her head. “Maybe this is some guy’s hideout and he really likes donuts,” Edgar said. Autumn glanced at the donuts, the machine, and the floor alternately, trying to piece the puzzle together in her mind. “No, he’s clearly trying to hide that chest below here,” Autumn muttered, half to Edgar, half to herself. But the word “nutrition” caught Autumn’s attention. Donuts were junk food and they clearly were the key to getting down there. It would require creating strong downward force. Donuts were junk food—fattening. Heavy. She gasped and began scarfing down the donuts. It was happening so fast that Edgar was taken aback. “I figured out how to get down to that chest,” Autumn said between bites, her words muffled by the mass of food filling her mouth. “Good, then it should be working,” Autumn said, not even taking a pause between her constant devouring of maple-covered and jelly-filled donuts. And indeed, as Autumn continued her mealtime massacre, her belly began to expand and her face and limbs began to puff up, until she looked like a giant water balloon. When Autumn noticed the creaking sound and the dipping feeling of the plank floor below her, she crouched on her little stubby legs and leaped into the air as high as she could—which, due to the heaviness of her body compared to the smallness of her legs, was not too high; and yet it created enough downward force to break straight through the wooden floor down to the dirt ground below, where the red chest awaited. She was so excited about her victory that she instantly made for her pockets to drag out the key, only to discover her fingers were too thick to fit into them. Edgar, who was stunned by the impact of the breaking planks, had recovered and was now carefully climbing down to the level Autumn had fallen down to. “Can’t talk now; busy,” Autumn said as she hustled back and forth, shifting her arms front and back, in an attempt to lose all of the weight she’d gained. As is common in reality, after a mere ten minutes, Autumn exercised all of the fat out of her and she was back to her original weight, albeit with somewhat stretched-out clothes. Now that her hands were small enough to fit into her pockets again, Autumn was finally able to fish out the red key, and with it she opened the red chest to find a match and a red ruby tablet. “I guess this’ll come in handy later on,” Autumn said as she pocketed the match. “But where do we go now?” Edgar asked. Autumn looked in the direction opposite the chest to see a river of green water moving away from her and Edgar. When they returned to their raft, Autumn and Edgar paddled back to the main area and then toward the other open passageway. As they floated down the passage, they found the path became vertically narrower until they had to duck. But eventually the low ceiling ended; Autumn and Edgar turned around to see that it was the bottom of a couple of rocky steps leading up to a green treasure chest. The rest of the river went in a backward current, making it impossible for the raft or Autumn and Edgar to go any farther. Thus, they had no choice but to climb up to where the chest stood. Looking up, Autumn could see a metal wire net attached to the back wall; she figured it was probably the only way forward. They climbed up, hanging on with their fingers and feet in the net holes—which Autumn found difficult with her feet, due to her bulky tennis shoes. Before Autumn could register she felt slimy tentacles wrap around her wrists. She looked up to see a human-head-sized ammonite hanging just above her, its eyes bulging and its fangs hissing. Before Autumn could do anything, she felt a vibration flow from her hand to the rest of her body, which eventually grew into a full-on static shock that stunned Autumn so much that her hands and feet lost their grip. The ammonite released Autumn’s wrists, eliminating her only defense against gravity, which was now plunging her straight down toward the running green river below, until she hit the bottom with a giant splash. Edgar gasped and tightened his grip on the metal net so hard that it began to hurt his fingers until he saw Autumn’s head burst back above the surface, panting and spitting. She swam back up to the steps and was soon back up onto the net. Edgar was so preoccupied by these quick events that before he knew it, Autumn was already next to him on the net. “I guess we’ll have to keep our eyes pared for those shelled octopus creatures,” Autumn said. This turned out to be prescient: Halfway through the net path again, she saw an ammonite who was cornering Edgar near the bottom of the net and kick it away before it could reach him. Soon after, they reached the end of the net and dropped down to a high cliff just below, looking down on the current running back to the steps and the chest on one side, and another river running the same direction down on the other side. A meter or so forward hung two clumps of rock: one hanging down from the ceiling with spikes pointing down and one underneath with spikes pointing up, leaving a narrow gap between the spikes and a narrow gap below, above the river. Autumn winced as she surveyed this obstacle: She could either magically fly between the spikes or try swimming against the current below, which they already learned earlier they couldn’t do. “Now how are we supposed to get through this?” Autumn said. “Maybe we’re supposed to use this owl to do something,” Edgar said. Autumn turned back to Edgar and followed his outstretched hand to a large—almost as big as Edgar, and much wider—owl in a gray sweater vest with eyebrows so long they protruded from its head sleeping against the wall opposite the metal net. She walked over to it and poked it. Its eyes popped open, its wings rose, and it suddenly jumped into the air and fluttered around in circles, squawking madly. “How will this be any use to us?” Autumn said. “I dunno. Maybe we’re supposed to fly with it,” Edgar said. As absurd as the idea sounded, Edgar’s reasoning seemed sound; besides, she had no better plan. So she looked up at the circling owl, still blathering paranoid nonsense, and waited until it was above her before hopping and grabbing its… claw? It took until then for her to notice it had only one leg protruding from the middle of its body. As she pondered the strange phenomenon she felt Edgar wrap his arms around her waist and hang on behind her. If the owl panicked when it was woken, now that it had these two strangers hanging onto its leg, it was going completely pineapples—which is even crazier than bananas. But rather than flying around in circles, it now zipped straight for the narrow passage between the spikes, which did not frighten Autumn and Edgar one bit. “Th’saws! Ey com to chop th’trés dow!” it bleated. While Edgar closed off the sight of his eyeholes and gripped Autumn tightly, she briefly speculated whether there was a way to control the owl. When she couldn’t think of a way, she made due with hanging patiently and awaiting either the end of the spike pit or impalement. The owl seemed to know where it was going, anyway, turning when the spikes turned perpendicular; she only wondered whether it would do so without impaling them—either accidentally or intentionally. Although the owl wasn’t perfect in its dodging—giving Autumn and Edgar a few scrapes and scratches along their feet, legs, and arms—they made it to the end of the passage in two pieces, toward a small cliff against a wall holding a green key. The owl didn’t bother to slow as it made toward the wall, which Autumn used as a sign that she should jump off above the cliff. She did so and ducked with Edgar just in time for the owl to crash into the wall, creating a loud explosion. When the noise of thunking metal ceased, they rose and opened their eyes to see scraps of metal lying on the cliff; looking down they could also see some scraps floating down the river. Edgar looked down at the river that was at least three meters below them. “We’ve fallen farther,” Autumn said. And with a grab of Edgar’s hand, she jumped down into the water. Much like the last time she fell in, she quickly jumped up to the surface and spit out the filthy water that seeped into her mouth before setting off down the river—an uneventful trip, except for maybe their need to duck under the cliff where they first found the owl. It was not long before they reached the rocky steps—and Autumn wasted even less time scrambling up to the green chest and opening it. Inside she was not surprised to find a green emerald tablet, as well as a bunch of dynamite sticks with a strip of black tape wrapping them together. Remembering the only passage they hadn’t ventured through yet, she immediately returned to the raft, where Edgar was still waiting quietly, and without a word rowed out into the main area and toward the eastern side, where the opening blocked by the pile of boulders lay. “Wait here in the raft and be ready to start paddling when I jump back in,” Autumn said before climbing out to land. Edgar, who saw the orange plastic sign with the picture of TNT on it didn’t need to ask why. Autumn set the dynamite against the pile of boulders and struck the match she found in the red chest. She carefully moved the flame toward the fuse, and when the fuse was lit she jumped into the raft and commanded Edgar to paddle. They were already near the middle island when they heard the TNT explode—as well as the splashing of stones in the water afterward—leaving a hollow ringing in their ears for the next four minutes. They turned around and saw that the opening and sign were still in perfect tact; the only difference was the conspicuous lack of boulders blocking the way. Compared with the previous two passages, which were full of exhausting traps and obstacles, this new passage seemed eerily empty: It was nothing but a long pathway littered with gems and gem-holding pots. Autumn stared furtively around the hall, especially behind her. Something’s suspicious about this room… she thought. She received her answer five meters down the path, when she heard scraggly rolling sounds growing louder behind them. They turned around to find a giant boulder rolling toward them. Though it required some deliberation, they soon decided it would be best if they ran away from it. As they did so Autumn alternated between looking forward and looking back. There was an upside and a downside to this predicament: On the upside, they were able to run faster than the boulder, which meant they were probably not going to get smooshed by it; the downside was that running this fast made their legs awfully tired. But as the race went on some other issue caught their attention: a blue key hanging up from the ceiling. Although the ceiling was low, Autumn hopped and found that she would not be able to reach the key when it came by. “How are we gonna get the key?” Autumn asked. Edgar looked up and saw it. “Yeah, the ceiling’s too high for me to reach. Do you think the guy who set this up expected us to jump on this boulder to reach it?” Autumn asked. Edgar didn’t reply. He was lost in thought, looking up at the ceiling and then Autumn. “I think I have an idea,” Edgar said. Edgar grabbed Autumn’s shoulders and hoisted himself up, holding onto Autumn’s head tightly to avoid falling off from the unsteadying movement of Autumn’s running. Autumn said nothing, already guessing what Edgar had planned. Edgar saw the key rush toward them and raised his arm up in the air. He tightened his hand as the key passed through it, yanking it off its nail. Autumn looked up and saw Edgar waving the blue key up in the air. “Hey, awesome job!” Autumn said as she high-fived his key-holding hand—the only one that was free. But their celebration was cut short when Edgar was suddenly knocked off her back by the frame of the doorway between the passage and a wider, but much shorter, room with the blue chest standing against the back wall. Autumn had little time to acknowledge this sight, as she turned around immediately to see Edgar lying on the ground under the door frame. She turned just in time to see the boulder smack against the frame of the door, stopping it in its tracks. Edgar held up the key to Autumn; but before she could reach out to get it the door frame suddenly collapsed down on top of him, under the weight of a ton of rocks and soil. Autumn cringed her eyes closed in shock, only witnessing the sound of the heavy crumbling of rocks… and the cracking of bones. When she reopened her eyes, all she could see was Edgar’s arm poking out from under the debris, still holding the blue key. Autumn stood frozen solid, staring blankly down at Edgar’s arm while her mind tried to register what had happened. All she could hear was the crackling of tiny pebbles against the ground. The air was empty with silence. “Exactly,” Autumn said with a nod. She opened the blue chest to find a strange yellow-green-brown jar shaped like some bulbous figure with a flower on its head, which Autumn thought might fetch a cute coin or two; but what was really important, and what Autumn guessed would be inside, was the blue sapphire tablet. It took a while for Autumn to dig out enough rocks and dirt to leave an opening for her to climb out through—although it was made less tedious by Autumn’s constant hope that Edgar would soon, any minute now, climb out from under the rubble and reclaim his missing arm. She even procrastinated, digging out much more debris than she needed to leave enough time for Edgar’s recovery. But when the hole was dug so huge that it risked caving in again, which would have forced Autumn to start all over—Not to mention that it might kill Edgar, she thought—Autumn finally crawled back out, walking down the long, empty pathway. Along the whole way back to the tablet door she kept looking back—especially at every sound she heard—expecting Edgar to be not far behind her, saying in his wimpy voice, “Wait up, Autumn; I’m all right.” When she wasn’t looking behind her for Edgar’s body she spent the rest of her time staring at Edgar’s arm, speaking to it reassuringly and hugging it tightly. She plugged the red, green, and blue tablets in the three vacant slots and they glowed in their respective colors, just like the yellow tablet was still doing in its slot. Soon after, the ground rumbled as the door slowly slid upward, revealing a small room buried in red, green, blue, gold, and pink gems—as well as one lonely scrap of dusty paper, which, Autumn could faintly see from afar, was covered in scribbly writing. But what truly caught Autumn’s attention was the giant, blindingly bright, glowing diamond hanging from the ceiling, above a plastic blue frog statue. She made for it in an instant, climbing up on the frog statue and snatching the diamond off its catch. Autumn was so dazzled by it that she hadn’t noticed the statue below her flatten down. What she did notice was the room rumbling, the sound of tiny pebbles crumbling down the ceiling and walls, and a booming voice shout, “Hurry up!” followed by ominous, off-key piano music. She looked down and saw that the statue she was standing on was a switch that was now being pressed down by her weight. What’s more, the gray cylinder below the blue frog was now open, revealing a lit bulbous black bomb. She scrambled for the door, only to find that it had already caved in, much like the one that… injured Edgar. Anyway, she had no time to think about this too much, as the ceiling was crumbling all over, including some large rocks she had to make an effort to dodge. Autumn scanned around the room frantically until her eyes caught a small hole in the back wall. She bent down in front of it and, with a little more digging, was able to crawl inside. The passage was ash black, which is not incredibly rare for a little hole in the wall lacking lighting fixtures or lamps; and since Autumn forgot her flashlight in her hurry to escape, she had to make due with scratching blindly in front of her, which was difficult with only one hand, the other arm preoccupied with holding the large diamond and Edgar’s arm. She could hear nothing but the crumbling of rocks and dirt. But Autumn’s discussion was cut short when her hands scratched solid metal. She thought about trying the sides—however awkward it would be without the ability to turn her body toward them—but decided that the pressure of the tons of rocks above her was getting tiring. She crawled backward toward the opening, hoping that the other room hadn’t caved in, when she felt her feet hitting hard rock behind her. She kicked behind her in every direction, only to find that the whole opening was clogged. Autumn’s eyes bulged as she noticed the tight feeling in her lungs. Not only was the opening blocked off—the only passage for air to move through was, too. Because of the tight space, she couldn’t turn around, so she made due with digging the dirt to her right wildly and shouting, “Help! Anyone?” as loud as she could in the desperate hope that someone would hear her. But she knew neither option had more than a shard of a chance of success. As she felt her body buzz with numbness from the lack of oxygen, she thought of how odd this situation was: She’d been in plenty of life threatening situations, and she’d been through plenty of situations in which success was impossible; but this was the first life threatening situation in which success was impossible. She wondered why that was.